Browse our Gatlinburg, Sevierville, Wears Valley and Pigeon Forge cabin rentals with fireplaces. Many of these rentals offer wood burning fireplaces, but others offer gas log or electric fireplaces for additional warmth in your cabin. If you love the fragrant smell and warm glow of an old-fashioned fire, a cabin in Pigeon Forge with a wood burning fireplace is not as rare as you might think. Whether you're planning a special getaway to the mountains with your sweetheart or you just love sitting by a warm fire, our cabins with this excellent amenity are just right for your trip! Starting with fall, the Smoky Mountains air is filled with the aromatic fragrances of wood burning in cabin fireplaces throughout Pigeon Forge, Gatlinburg and Wears Valley. Cabins USA believes in preserving natural resources by protecting our forests, this is why many of our cabins fireplaces are stocked with wood from local tree cutters who have harvested fallen timbers or extracted trees for the sole purpose of safety. As winter gives way to warmer months guests start planning spring and summer vacations, fireplaces give way to outdoor cookouts and swimming pools. All our cabins have gas or charcoal grills and these are pages of cabin rentals with swimming pool access or in-cabin private swimming pool cabins for your perfect Smoky Mountains cabin rental getaway. Escape to the mountains for a luxury retreat at a one-bedroom cabin in Sevierville that offers guests a fireplace, hot tub, and more! Come have an “Ah-Mazing” cabin stay! Escape to a delightful cabin in the Pigeon Forge Smokies at "A Romantic Journey" and enjoy swimming pool access, a romantic interior, and more! Come stay in your own "Bearadise" in the Smokies at the 1 Bedroom Pigeon Forge Cabin with hot tub, game, jacuzzi and more! One bedroom Pigeon Forge cabin rental in town with resort swimming pool access. Mountain Park Resort is 5 minutes of the action filled Pigeon Forge Parkway! Feel like a pioneer in "Moose Tracks," a rustic Pigeon Forge cabin with hot tub, fireplace, pool table, and more! Come stay at this Arrowhead Ridge Resort Pigeon Forge cabin “Royal Romance!” This a 1 bedroom cabin overlooking Pigeon Forge rests only a half mile off the action packed Pigeon Forge Parkway. Romantic Smoky Mountain cabin rental in Sevierville with views, hot tub, jacuzzi and fireplace near Pigeon Forge attractions and shows. Online Cabin Discount! Located less than a mile from the Pigeon Forge Parkway, you'll find this romantic honeymoon cabin that comes with a hot tub, a wooded location, and a 15% discount! Come experience a 1 bedroom cabin rental in Sevierville that comes with a hot tub, a pool table, and a nice location near the Pigeon Forge Parkway! Take the whole gang to this Pigeon Forge family cabin where you can enjoy a fireplace, hot tub, and more on your cabin vacation! Stay right on the river in Pigeon Forge when you reserve "Bear Paw Chalet," a 2 bedroom vacation home that's less than a mile from the Pigeon Forge Parkway! Little Cove Hideaway cabin rental is a 2 bedroom Pigeon Forge area vacation rental nestled in a tranquil Smoky Mountains cove off Pigeon Forge Parkway Light 10. Stay at our Smoky Mountains cabin rental with Online Discount! Daydreams is a Smoky Mountain 2 bedroom cabin with swimming pool access near Dollywood. "A Bear Trax" is an affordable 2 bedroom cabin that's between Pigeon Forge and Gatlinburg in beautiful Sky Harbor Resort. Book today & save with Cabins USA! Enjoy a 2-bedroom cabin near Pigeon Forge with hot tub, fireplace, and more! At "A Little Bit of Lovin'", you can enjoy a cabin escape near Pigeon Forge! Welcome to "Absolute Heaven" an affordable 2 bedroom cabin in Sevierville that comes with a gas fireplace, hot tub, and a prime location near The Parkway! Stay at this 2 bedroom Pigeon Forge cabin that sleeps 6 with your family! Features fireplace, hot tub, pool table, and more! This Pigeon Forge Tennessee vacation rental is located in Rainbow Ridge Resort and offers quick easy access to Dollywood and downtown Pigeon Forge. Enjoy a mountain escape at this unique cabin near Pigeon Forge, "The Barn". Offering guests 2 bedrooms in a converted space, this cabin is sure to offer a memorable Smoky Mountain vacation! Book "A Hidden Mountain 360," your 2 bedroom cabin in Wears Valley with a hot tub, jacuzzi, foosball table, offers a large forested lot and rests just minutes from exciting Pigeon Forge, TN! Reserve your Bluff Mountain cabin near Pigeon Forge, “Apache Sunset,” for awesome mountain views and a convenient location to downtown action-packed Pigeon Forge! Come stay at this log cabin near Dollywood with your family and enjoy cabin features such as hot tub, fireplace, satellite TV, and more! 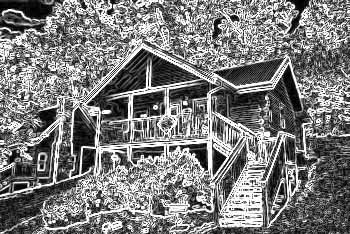 Secluded 3-bedroom cabin rental in the Smoky Mountains Glades Arts and Crafts Community Gatlinburg TN. "Sassy Lady" is an affordable cabin that's ideally located for enjoying Dollywood, Pigeon Forge, and Gatlinburg from its location on Upper Middle Creek Road. Take your family to this secluded Pigeon Forge cabin that offers a jacuzzi tub, hot tub, fireplace, and more! Come have a fabulous vacation in Pigeon Forge! A large cabin with pool in Pigeon Forge, "Fishin' Hole" waits for you. Check out this cabin or our other large cabin rentals Pigeon Forge, TN!